I don’t like getting lost in video games. I love to explore and find secret treasures in the depths of a virtual world, but I’m methodical about it. It’s why I use the map in Metroid, and it’s also why I only travel in straight lines in Assassin’s Creed Odyssey. Even when it makes no sense and results in a slower and more inconvenient journey. If I come across a mountain, I climb it, always keeping the quest marker in the center of my screen. If I run into smaller obstacles, I don’t bother to go around them, whether it’s a house, a fence, or towering wall. If I reach a body of water, even a tiny pond, I dive in and swim across. If I run into some enemies, well, the only way out is through. Part of it is because Assassin’s Creed has such satisfying animations for climbing. You can climb almost anything in these games, so why not do it whenever you can? One downside is that climbing is not very fast; in many cases, it would take me far less time to go around than go over. But I still prefer going in a straight line. At this point, it’s become a funny challenge to myself as I play: always making Kassandra go the “fastest” route to her quest marker, even if it isn’t fast at all, and even if it ends up being incredibly difficult to do. The habit actually started with Assassin’s Creed Origins, and in that game, it made even less sense. 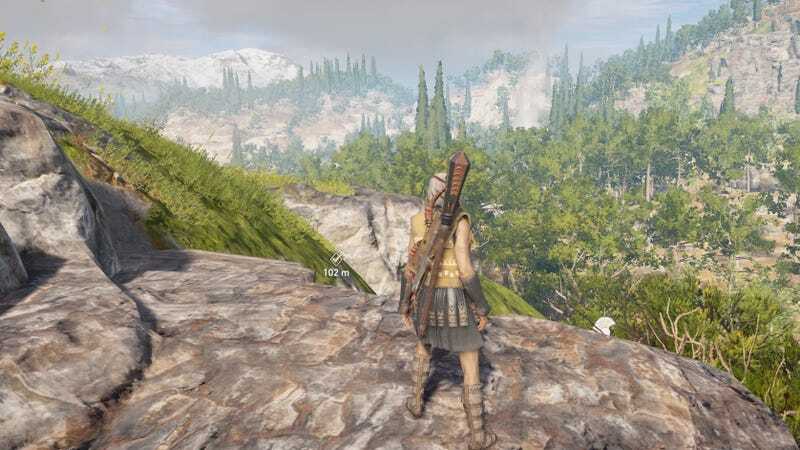 I’m still early on in Odyssey, so Kassandra has mostly been hiking through woods and mountains and ponds; traveling in a straight line makes sense, most of the time. In Origins, though, Bayek would be navigating through busy city streets with plenty of paved roads and paths. While every other pedestrian traveled on those roads, Bayek would be huffing his way over the top of a massive temple, straining his muscles to reach the top, only to then lumber down the other side again. Allow me to ruin this already bad joke by explaining it. In the early days of the internet, before almost everyone had a smartphone with location services, there was a website called Mapquest where you could look up directions and print them out. Usually, Mapquest directions would recommend the shortest possible distance between two points, no matter how inconvenient it was. This was in the early days of computer-generated directions, so the available data about different locations wasn’t even close to as comprehensive as it is now. A lot of times, you’d end up on a route that didn’t make sense or, possibly, wasn’t even traversable (a bike path, a one-way street, etc). You’d get shunted onto bizarre side streets that provided a “direct” route, even if taking a major thoroughfare would have technically saved you time. Sometimes you’d pay a highway toll only to travel one exit’s length. It was very stupid. And it’s pretty much what I’m making Bayek and Kassandra do in their respective Assassin’s Creed journeys. Last night, while playing Odyssey, I tried to take Kassandra on a scenic route instead. I ignored the quest marker, taking the time to enjoy some of the game’s beautiful views, not worrying too much about where I ended up. It went great until I tripped over a fortress guarded by baddies who were several levels above my heroine. After an outmatched slugfest, Kassandra got desynchronized and I loaded up my last save. I could have run into that same fortress just from going in my usual straight line. But still, it seemed like a sign. Kassandra is going to stick with Mapquest. At least until she gets a smartphone.